Tempest recently chalked up its ninth month of craft beer writing. To celebrate the occasion, I’ve been posting an annotated index of articles that I’ve written to date. 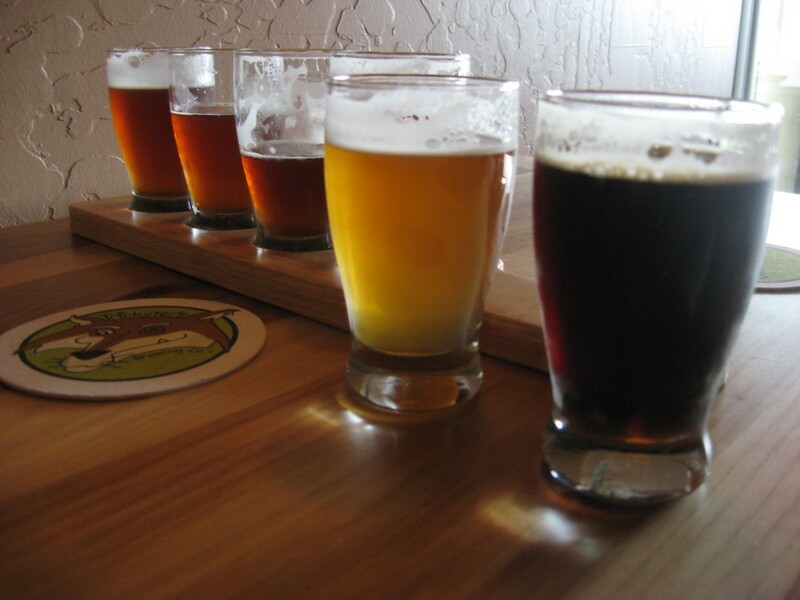 The first segment listed my articles on beer and culture, followed by my regional spotlights. This segment includes a list of my brewery profiles and beer reviews, along with a few recipes for those interested in cooking and food/beverage pairings. Thanks again for the support over the past several months. Enjoy! By the mid-90s my tours as a children’s entertainer an educational service provider had reached as far as Lafayette, LA and Portland, Maine area. Summer, I’m guessing 97 or 98, I was sitting in Shipyard’s brewpub: Federal Jack’s, in Kennebunkport, Maine, looking at very expensive sailboats sail in and out of the inner bay, probably sipping on an Old Thumper, among other quaffs. Pours gold with good clarity and some bubbles are seen rising to the top. A fat head of white foam that leaves a ring and some lacing. Nose is not remarkable. It’s clean. Not even too much malty scent. Just a bit of malt scent and some mild hop grass. No fruity esters at all. Faint bit of musky spice as it warms. The taste is smooth mild and very even. Hops balance this one unobtrusively for a bready but light taste. The mouthfeel is medium and has some good bite from carbonation. The spice is as much a part of the mouthfeel as are the bubbles and I like that. The malt is bready but not too sweet. Finishes clean and dry with no fruit flavors at all. There is a bit of sweet grass in the drink but it too is very mild. The hops become a bit floral and perfumey as it drinks and it tickles the back palate with that spice and dry bread. The Old Forge Old Ale Competition is all high gravity, collapsed category, so obviously I am very much in favor of collapsing categories. There are just some that shouldn’t be combined, and some you should be careful with. Lots of people really like this. I do not like this.
. Pours pretty enough. Reddish orange with a thin head of khaki foam that falls fast. Nose is very sweet fruit. Floral and just a sugary sweetness. Hard to name a fruit. The malt is caramel and also smells sweet. There’s no herbal no depth. Just sweet and a touch of alcohol fumes. Taste is cough syrup. Sickeningly sweet fruit meets hop bitter. The caramel is thick and pronounced and then fades out to the alcohol on the palate and the hop bitterness that over rides s the fruitiness. it’s got way too much alcohol. it was hard to rate the mouthfeel. For a 12 percent beer it had a 12 percent mouthfeel. For an IPA it had a syrupy sluggish and very slow mouthfeel with some stickiness. Tasted awful and I actually made a face. Thank you Roguer for the chance to try this beer. If you know me then you know I am not fond of the black IPA. I find the style elusive to me personally. I think that the roasted and heavier stout like qualities of the malts clash with the citrusy and IPA like qualities. And that chocolate, while it does go with orange, does not go very well with grapefruit. This beer has changed my mind about the style. Pours very dark like black walnut with a crimson hue deep within the beer. A fat khaki head of foam falls slowly and leaves lace. The nose is bright with grapefruit. Really tart smelling and earthy with a bit of the peel. Some toasted sugar comes forward as it warms and a bit of dark malt scent like coffee. The taste is excellent. The mouthfeel is thin and has the quality of a good light IPA. The malt takes center stage in the drink as it comes forward with a touch of bitter roast and some weak coffee. A light caramel and some citrus take up the mid palate where the grapefruit has been tamed but still very much present. Finishes dry and roasty with a bit of the malt sweetness and a hint of char to linger at the back of the throat with some of the bright citrus peel. What it does not do is blast away at the finish with hop bitterness and that lets those roasted malts linger a touch with the citrus as a gentle compliment. I really liked this one and I think 21st amendment has shown us what is possible with this style. They have struck a balance between what tastes good and what is just for show. Some may call the flavors weak or diluted but I think that one has to account for the idea that a lighter palate does not require as much effort to understand it. The balance in this beer is apparent as the malts come forward but not heavily. The malt is as light as it could possibly be and still be roasted almost black. Light and drinks lightly. I love it!